friday fluff- jeggings. I’m totally down. A few weeks ago I wrote about the denim leggings phenomenon a.k.a “jeggings” as in jean-leggings. I was kind of weirded out and skeptical about them. Then I became obsessed with seeing what the hype was. Apparently others are hyped up about jeggings too because I called four Targets in my area to score this lovely pair to no avail. so cute! at $10 no wonder they're sold out at target.com too. Thankfully Jesus didn’t say anything about jeggings in this scripture, so I think I’m off the hook for being temporarily obsessed with this fashion trend 😉 I did end up finding a great pair at the same price at WetSeal, which I ordered online because I forgot that they had a store in my local mall- boo for having to pay shipping! they are ridiculously comfortable. it’s almost like wearing your pajamas around except you look cute instead of grungy like you just woke up. they’re great under boots. skinny jeans often are too tight on the calves under boots, but jeggings give you the look without the pinch. you can spend a ton on jeggings as you can on any fashion trend. But will they be around for that long? doubtful. $10 is a reasonable amount to spend on something fun and trendy. these are not a fashion investment. you can wear them in multiple seasons- spring when it’s too warm to wear jeans but too cold to go bare-legged with shorts or a skirt, fall or summer with a long sweater. The pair from WetSeal have a low-rise waistband. Really? who wants low-rise jeggings? Aren’t they revealing enough with being skin-tight & all? Consequently you need to hike them up every once an awhile. They’re skin tight. After all, they are leggings. This limits what you can wear with them unlike skinny jeans which may be tight but not nearly as revealing as jeggings. I do like the look with a long shirt or sweater though. doing a little jeggings dance. What fashion trend have you been obsessed with lately? 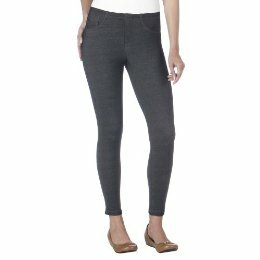 Has anyone else jumped on the jeggings bandwagon? Send me a pic of you looking cute in your jeggings if you have & I’ll post it on a “friday fluff” post about fashion! you pull it off well. i think it’s all about coverage. any legging with a long tunic top is ok. leggings as true pants, i can’t stomach. i’m all about the sweater dress with black tights and black boots. similar look. very comfy for church. figure flattering. 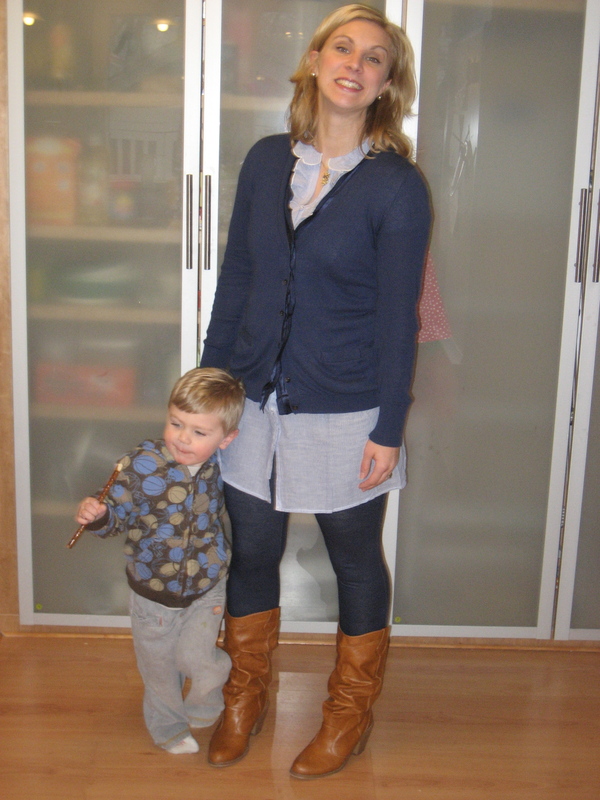 I love the photo with the brown boots – cute outfit! I’m glad that the jeggings are working out for you. Just make sure to work out for those jeggings! I have no doubt that they are comfortable. Enjoy! this may be the item i get for my clothing quota in the next month. You look great! Love the photos! I’m glad that you tried out jeggings. Skinny jeans are a little stiffer than legging jean, so if you do go for a pair of skinnies, go to the fifteen dollar store online and get paris blues skinny vintage wash. They are great! they look like normal blue jeans but have more of the legging feel than normal skinny jeans. this equals less hiking up…..
Love the leggings – Currently they are my favorite – Especially the jeans one..